Feeling so much more positive towards PT (personal training) now, and look forward to actually doing it!! I think when the 8 weeks are up, I’m going to feel a bit lost..! Today I did PT with Kieran, and we got a lot done in an hour!! We started with a warm up for 2 minutes on a bike, then straight into 3 minutes of cardio on the bike. We then headed into the studio where he had 3 stations set up. I start at 1, did 12 reps, straight onto 2, did 12 reps then number 3, with 12 reps each side. I then had to start again from the beginning straight after but this time decreasing the reps to 10, then repeated all 3 sets straight after the other decreasing by 2 reps each time until I got to 6. I then had a couple of minutes break and started again, but this time starting from 6 reps and working up to 12. It was very hard work, but I still really enjoyed. We then went into the gym space again where I started on the abduction machine, using 30kg weight, and this is where you sit on a chair and basically open and close your legs, working your thighs and bum. It really does burn!! I done 15 reps x 2. We then went onto leg press where I started with 20 kg, done 15 reps, rested, upped the weight to 30kg, done 15 reps, rested, then upped the weight once more to 50kg, 15 reps. It was really hard!! But I pushed through and Kieran’s encouragement really helps!! I then went onto cable pull through… I could not keep a straight face doing these!! I had to stand with the wire between my legs, holding onto to balls attached to a rope, and basically bend and thrust your hips forward, clenching your bum at the top. My weight was set to 8.5 kg (I think), but it was enough as you have to find your balance or the rope pulls you back to the machine. I did 3 sets of these. We went over to the weights where I did ‘seated shoulder press’, using 5 kg dumbbells, followed straight after by standing hammer curls, again using 5kg. I done 15 reps of each, 3 times. I finished with rope push downs into rope overhead extensions. Using the cable machine with the rope again, I pulled the wire down from my chest, then turned my back to it, done a lunge forward and pulled the rope over my head. I done 15 reps of each, 3 times, using 8.5kg again. We finished on the bike again, upping the level every minute for 5 minutes then stretched out. Overall, I really enjoyed this PT as it was varied and covered a lot in just an hour!! My PT was with Bella again, and it was very ‘boxing’ orientated. 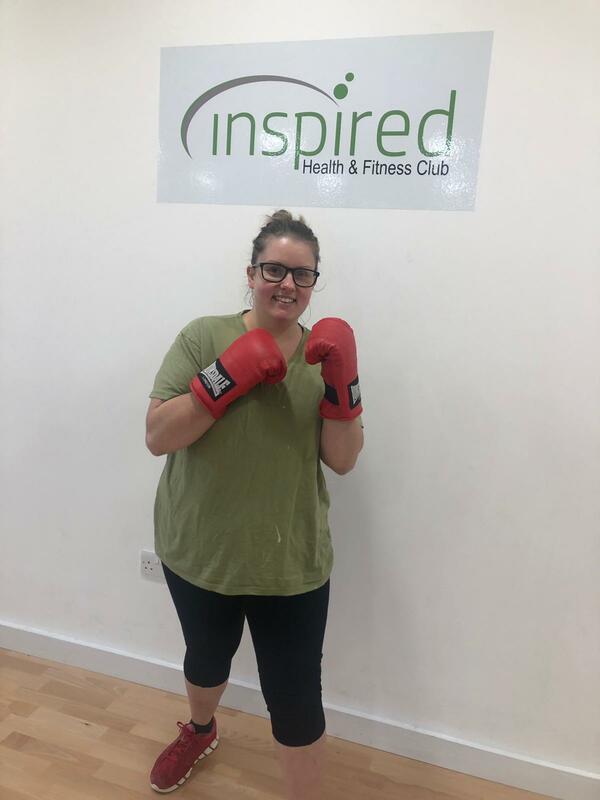 Which I don’t mind as you work your whole body doing boxing, and I’m actually starting to enjoy it, feeling like my punches are getting stronger but still struggling with my coordination!! I started by doing a warm up on the rowing machine, rowing for 800m. We then went into the studio where I started with boxing sprints. So, I punch 4 times, sprint, then return, punch 4 times, sprint. Repeating 8 times. It was very tiring but it felt good. We done 3 sets of these with a small break in between. We then went into bag squat jumps and step ups. Bag squat jumps are horrible!! You have a 10kg bag on your back, squat and jump from one end of the studio to the other, then straight into step ups x 40. It looks so easy, and it is easy, but being my size, I did struggle!! Again, it’s not something I would say I have a problem doing as they’re over quite quickly. I don’t 3 sets of these. We then went into a bit of general boxing, moving about the room and adding some ducking movements (coordination problems again!!). Finally, I did squat thrust sprints, straight into bunny hops. These were worse than the previous exercise. They’re a bit like burpees, except you don’t jump up, you put your hands on the floor and jump your feet away then back into your chest x8, run to the other side of the room, repeat, run back, repeat then run back repeat, then into bunny hops, where your hands are on a box and you jump your feet over from one side to the other x 8. I struggled to lift both my feet at the same time but got there in the end. I done 3 sets of this, decreasing the reps by 2 each time. It was a very intense 45 mins or so, but then at the end you know you’ve worked hard!! I was excited for this PT originally, spin class with Jonny, Ryan and Mark. It was Jonny’s first time instructing a spin class properly and so we were acting as guinea pigs for him. He done really well and let me tell you, I have never sweat so much in my life!! It’s extremely intense, and not something I could do every week, I don’t think. It’s a lot of standing, sitting, upping reps, reducing speed etc. It done the job as I felt fully worked out, and I did enjoy trying it, but it was very knackering, and after about 20 minutes I was ready to give up, but kept thinking of my end goal which spurred me on!! You are moving constantly and don’t stop pedaling for the entire 45 minutes. Like I said, I enjoyed it, but don’t think I could do it every week. Over all this week has been really positive and can’t say I didn’t enjoy any of it. This coming week (28.1.19) I’ve got Bella all week and we will be doing another Body Stat Test to look for more changes again. Follow me on Instagram @slimming_with_kelsie_sw where I update it daily with what I’m eating etc! !